Although JEB is celebrating our launch of our first Australian showroom in Sydney, Australia, we have been working with the Australian market for six years. We’re honoured to have been invited to work with some of the top architects and designers on the most exciting new builds in the country. One of our most recently completed projects, the new head offices for Lend Lease, featured a custom JEB Partition that pushed our engineering and problem-solving skills to create a product that lived up to the robust and inspired brief by Dave Whittaker from Hassel. Dave Whittaker is the imaginative architect behind the previous Lend Lease head offices, completed in 2005. Timber pivot doors were the key feature in that design, and both the client and designer wanted to evolve this concept for their upcoming Barangaroo address. This brand new harborside business district in Sydney’s CBD showcases 3 large towers, each boasting new office working models, innovative designs and integrated technology. The Barangaroo site demanded that the interiors of the new Lend Lease space also push boundaries to match the modern location. As a response to this, boardrooms were to be situated around the the perimeter of the building to take advantage of the 360-degree views. Two parallel walls and two semi-circular areas define the tower floor plan. To preserve the view and light to the interior work areas, yet offer optional privacy to the meeting spaces, each of the rooms needed to be enclosed with glazed partitions made of switchable glass that provided a high level of noise reduction. Most importantly, these partitions needed to pivot, rather than being constructed from your typical fixed window and door scenario so that the users could open up the space when no meeting was in session to tie the spirit of the previous office in conceptually. This brief was presented to the JEB team through a series of renders and verbal briefs. With no precedent for exactly how this would work and no formal plans, JEB’s Custom Projects’ team needed to engineer a solution that featured automatic, switchable glass partitions and a high acoustic rating - no small challenge. During development of the 3m x 1.5m glass panels, both practical and technical challenges arose. Layout and safety were concerns due to the pivots, and acoustic mechanisms, glass functionality and locking devices also had to be solved. Over the span of 7 months, monthly face-to-face meetings with an international team, led by Tim Burndred, and Dave Whittaker were held and countless 3D printed models were made, tested, improved and reprinted. To deal with the weight, as well as keeping the open doors from protruding into the central area or boardrooms too much, the pivot needed to be placed in the centre of the panel, rotating around a central axis. The edges of the partitions then needed to be modified to ensure the smooth closure of the swinging edge, to which JEB proposed interlocking “L” shaped frames. These pivots operate mechanically (rather than manually), so another practical concern was the safety of people or objects that might be within proximity of the door while in motion. Speed was the first concern, so testing helped determine a reasonable pace where the door was fast enough to be efficient but slow enough not to crush an intrusion with its momentum due to the weight. Once this was perfected, the team experimented with both hard and soft close options. Safe, logistically sound partitions were only the beginning of the brief, however. Considering the high value of each panel, the switchable glass had to be treated with extra care to safeguard against the client or supplier or builder having to replace any of the panels at any stage of the design, installation or lifespan of the building. To ensure the client’s trust in the door and hedge against the risk of replacement, the glass, which is actually two fused pieces of glass sandwiching electric mechanisms that control the opaque and transparent appearance, were sealed on all the edges. This extra step is unheard of on smaller panels; it is well above the standard. However, the seal protected the switchable mechanisms to prevent costly damage. Tolerances were another major issue with such dynamic elements, especially as the partitions were to be prefabricated and shipped from Beijing and needed to allow for adjustments on site plus any variance between the plans and installation realities. JEB worked with a fantastic builder, Cubic, who coordinated structural requirements in unison with the development of the door system. Cubic was a huge support in the design and development process, problem-solving issues such as seals and closure and opening requirements, (among other things) alongside JEB. The most complex of all the obstacles was the issue of sound privacy for the meeting rooms, which was a non-negotiable feature. In order to block sound on a pivoting door, door seals needed to be created for all four sides: mechanically operated seals on top and bottom of each panel, interlocking seals on vertical edges. Sliding doors only require the side seals as the track can be developed to contain a sound barrier in the floor and ceiling cavities. 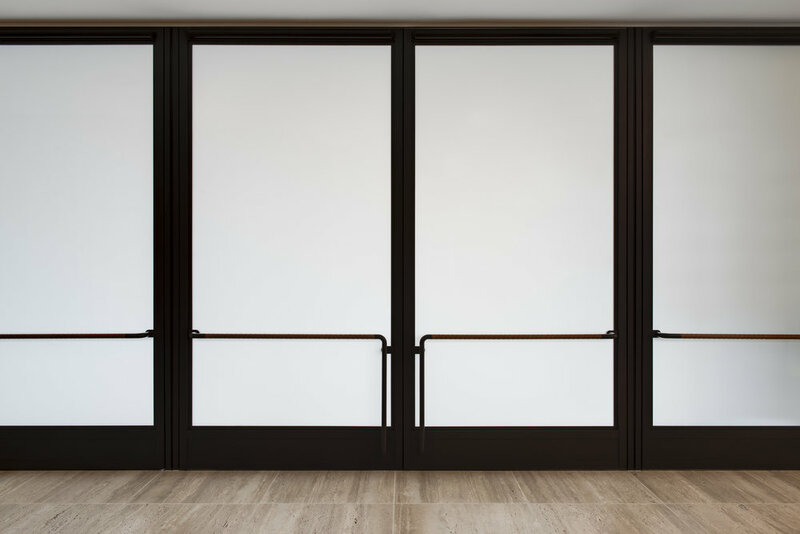 Typically, a door’s acoustic properties can be improved with increasing the glazing from single to double, but with the panels already being so large and heavy, this wasn’t an option. To overcome this, JEB spent a lot of effort sourcing a specialty acoustic glass and arranged for a special lab test to be conducted by an acoustic lab in Hong Kong. JEB invited the client, Lend Lease JEB’s headquarters to witness the test firsthand not only to give the clients surety in the result but to invest in the relationship. Ultimately, the highly challenging brief and incredible vision for the space came together with a stunning result. The space is incredibly unique, and the focus is on the modern, waterfront location and the client’s internal culture and history. The complex intricacies of the mechanics, acoustics, functionality and safety are invisible when appreciating the space, which is absolutely our highest achievement with this project. The beauty of the partitions contributes quietly to the incredible success of the overall design, which is the best possible outcome.